The Texture palette contains a variety of images and patterns. You can use Textures while painting. You can add Textures to this palette by importing images from disk files. You can also export any Texture as an image file, in a variety of formats. The LightBox>Texture button gives instant access to the Texture tab in Lightbox. The Reset button can be used to reduce the number of images in the Texture palette. 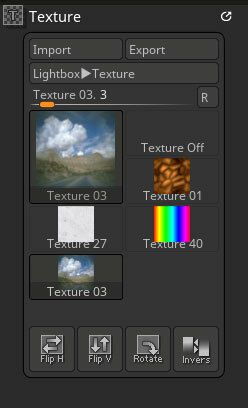 Textures are not removed completely and can be selected from the pop-up by pressing the Current Texture large thumbnail. Click on a small thumbnail to select that texture. The Inverse button inverts all colors in the current texture to their color-complement values.